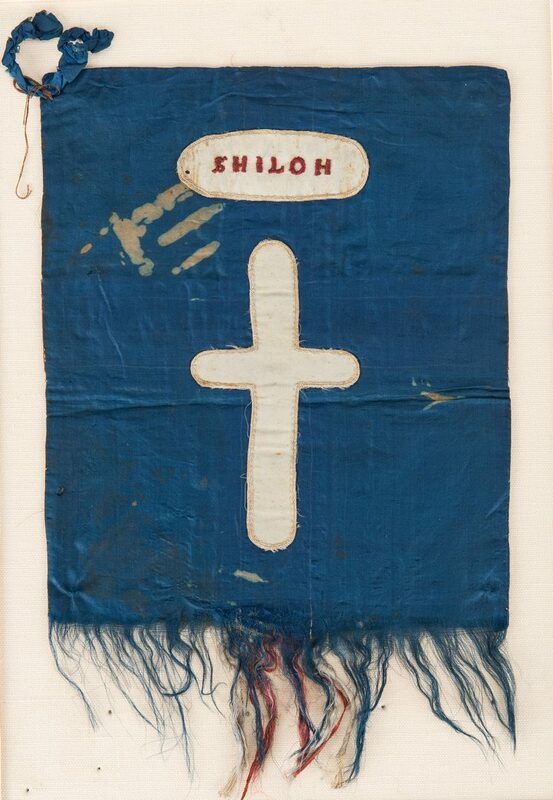 Battle of Shiloh, Major General Leonidas Polk pattern personal/bible flag, presented to S. Duff J. Lewis, 12th Battalion, Tennessee Cavalry. 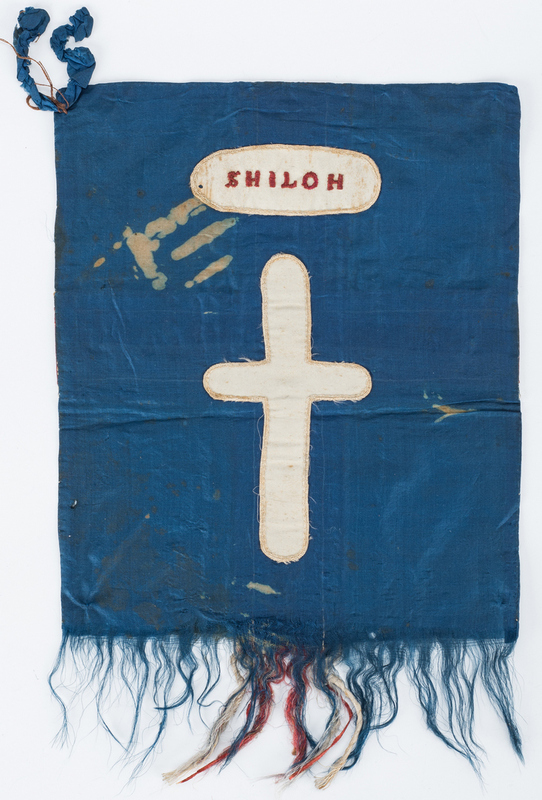 Flag comprised of machine sewn appliqued red and white silk on blue silk ground with eleven stitched stars in gold silk thread, obverse, appliqued white silk cross and oval with stitched "SHILOH" in red thread, reverse. 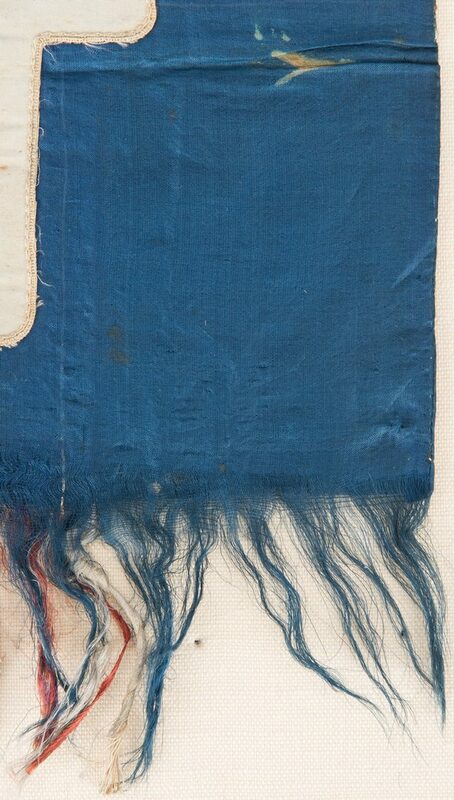 Blue silk loop, top right corner. Also includes a cabinet card portrait of Lewis with Wallin, Birmingham, AL studio marks. Signed by Lewis with later genealogical information, en verso. Flag housed under double sided glass in a frame. Case wishes to thank Military Historian Greg Biggs for his essay with additional information on this flag (see attached report). Flag – 11 1/2" H x 7 1/2" W. Cabinet card – 6 5/8" H x 4 3/8" W. Mid 19th century. 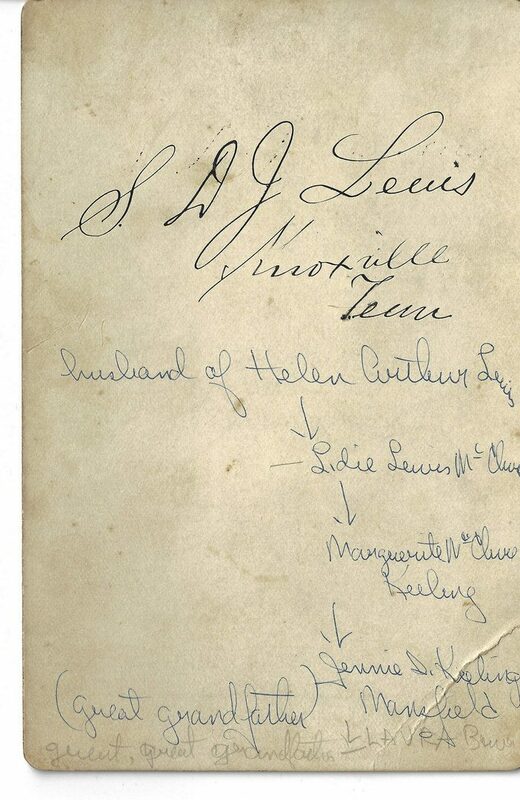 Provenance: Descended in the family of S. Duff J. Lewis. 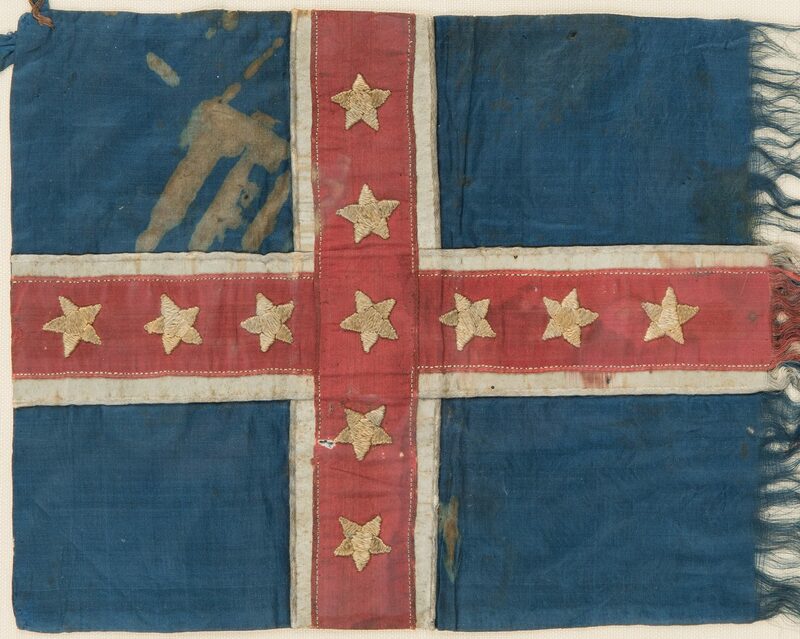 Note: BIBLE/PERSONAL FLAG OF S. DUFF J. LEWIS, 12TH TENNESSEE CAVALRY BATTALION IN A RARE POLK CORPS CONFIGURATION: This essay will cover the known details of a small Bible or personal flag formerly owned by Pvt. S. Duff J. Lewis, later of the 12th Tennessee Cavalry Battalion. As will be shown, some speculation, backed by evidence of location of Pvt. Lewis at a specific time frame, will be necessary as the record is not clear as to when exactly this flag was issued to or made for him. 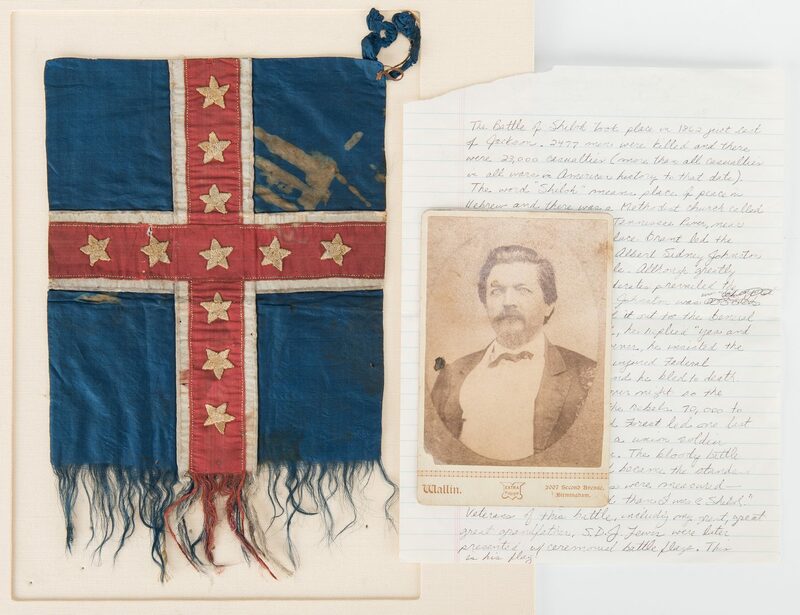 The flag itself is of a unique pattern and this will also be covered in this essay along with the unit history of the 12th Tennessee Cavalry Battalion and Lewis' war record as shown in the Compiled Service Records file from the National Archives. Pvt. S. Duff J. Lewis. According to information supplied to me by Case Antiques, Lewis came from a family where his father was a Methodist minister. Based on the unit he would join as to where it was formed and would fight in the Civil War, Lewis was from East Tennessee. While he is listed in the Compiled Service Records of the 12th Tennessee Cavalry Battalion (as Duff Lewis), he apparently did not join that unit with the rank of private until later in the war, possibly as late as February 1864. Prior to his joining that unit, Lewis was working for the Confederate Quartermaster Corps as a clerk in the military post office in the Department of East Tennessee which was under the command of General George Crittenden in September 1861. He apparently worked for Tennessee State Quartermaster officer Major Samuel T. Bicknell, who had been appointed as quartermaster in Knoxville, Tennessee by state governor Isham Harris. Bicknell would later apply to be a quartermaster in the Confederate Army with the endorsements of Confederate Senator Gustavus Henry and Confederate Postmaster General John Reagan. The forces of George Crittenden, under the tactical command of General Felix Zollicoffer, were defeated badly at the Battle of Mill Springs, Kentucky in mid-January 1862. Zollicoffer was killed in action and the army routed. Falling back into East Tennessee, many of the troops were then transferred to Corinth, Mississippi where a new Confederate army was being formed.Lewis in the Collapse of the Confederate Line in Tennessee and Counter Offensive at Shiloh. By March 1862, five different Confederate armies were defending the large Department Number Two, which ran from the Appalachian Mountains westward across the Mississippi River into Arkansas and Missouri. West of the river was the Army of the West under Generals Earl Van Dorn and Sterling Price (formerly of the Missouri State Guard). East of the river was General Leonidas Polk's Grand Division, holding from Memphis, Tennessee northward to Columbus, Kentucky, a huge fortress on the bluffs above the river. At Forts Henry and Donelson on the Tennessee and Cumberland Rivers near Middle Tennessee was the large garrison under General John B. Floyd, while to the northeast in Bowling Green, Kentucky, the Army of Central Kentucky defended the railroad to Nashville. This army was commanded by General William J. Hardee while department command General Albert Sidney Johnston was also present. Arriving in January 1862 from Virginia, was General P.G.T. Beauregard who assumed command over Polk as assistant department commander to Johnston. Lastly, split between Mobile, Alabama and Pensacola, Florida was the Army of Mobile and Pensacola under General Braxton Bragg.With the capture of Forts Henry and Donelson by mid-February, 1862, the vast majority of its garrison and the subsequent loss of the Tennessee state capital of Nashville only a few days later, the entire defense line of the Confederates collapsed. It was to reform along the Tennessee/Alabama/Mississippi border with the new base at Corinth, Mississippi becoming the rendezvous point. This town became a focal point thanks to the two railroads that joined there (including the most important track in the Confederacy, the Memphis & Charleston Railroad) and its closeness to the Tennessee River. This allowed the basing of a vast amount of supplies. Polk's Grand Division, the Army of Central Kentucky and Bragg's forces were ordered to meet at Corinth along with the Army of the West (although they would not arrive until after the Battle of Shiloh fought in early April) for the coming Confederate counter-offensive. A brigade was sent from New Orleans (Department Number One) as additional reinforcements as well as the remnants of Crittenden's and Zollicoffer's commands from East Tennessee, now under General (and former U.S. Vice President) John C. Breckinridge. On March 29, 1862, general orders were issued from General Johnston to form the new Army of the Mississippi, as their mission was the defense of the Mississippi River Valley. Polk's command became the First Corps (two divisions of two brigades each); Bragg's the Second Corps (two divisions of three brigades each), Hardee's the Third Corps (three large brigades) and Breckinridge's the Reserve Corps (three brigades).At some point in early 1862, Lewis transferred to the command of Major David Sullins (also listed as Sullens). Sullins, a Kentuckian, and former chaplain of the 19th Tennessee Infantry (an East Tennessee raised regiment), became a brigade quartermaster on January 7, 1862 in the division of General Crittenden, specifically the Second Brigade. With the transfer of those troops to Corinth after the Mill Springs disaster, Sullins and Lewis went along. This is based on two invoices in Lewis' file signed by Sullins as well as documents in Sullins' file. Sullins was then appointed as Brigade Quartermaster for Colonel W.S. Statham's Third Brigade (later Fourth Brigade) of the Reserve Corps, whose troops had fought at Mill Springs and whose brigade was created out of the two brigades from that battle (less a couple regiments who remained in East Tennessee). Indeed, one invoice, dated May 15, 1862, states that Lewis was being paid for, "one month's service as clerk in Brigade Quartermaster's Department from 31st March 1862 to 30th April, 1862". A second invoice for pay from April 30 to June 15, 1862 also covers Lewis' time serving with Sullins. Both are during the time frame of the Third and evolution into the Fourth Brigade, Reserve Corps which came later in April 1862. Invoices for both brigades can also be found in Sullins' file. These notations on the early history of the Army of the Mississippi and the cited invoice are important as it places Lewis in the right place and time to have enabled him to receive the flag in question for the Battle of Shiloh which was fought on April 6-7, 1862 in West Tennessee. Initially a Confederate victory, Union reinforcements arrived during the night of April 6th and on the next day launched a counter-attack that slowly drove the Confederates from the field. General Albert Sidney Johnston was killed in action and command of the army fell upon the shoulders of General Beauregard who ordered a retreat back to Corinth. Sullins resigned as a quartermaster in October 1862 but a month later he noted, "Capt. J.F.J. Lewis has been with me as my Assist. in the Q.M. Dept., since Jan. inst.," and goes on to recommend him as a quartermaster in the Confederate Army. While he gets his first name incorrect, he also, for some reason, lists Lewis as a captain. Nothing in Lewis' file bears out this promotion.Lewis did remain with the Quartermaster Department into 1863, where in January he was posted to the depot in Tullahoma, Tennessee, southwest of Murfreesboro. He remained there until the Confederate Army of Tennessee had been forced out of the Middle Tennessee region by a Union army under General William S. Rosecrans in the Tullahoma Campaign of June/early July, which led directly to the capture of Chattanooga in early September. Such supplies as could be saved from Tullahoma were loaded onto trains and sent to Georgia, primarily Dalton and as far south as Kingston, as the Battle of Chickamauga raged in mid-September. The victorious Confederates pursued Rosecrans back to Chattanooga but could never capture the city although they laid siege to it. That was broken in late November with massive Union reinforcements the Confederates falling back to Dalton, Georgia for the winter. In February 1864, Lewis began working at the depot in Kingston, Georgia and remained there into June, before the Union armies of General William T. Sherman forced that depot to be evacuated towards Atlanta. Here he worked for Captain A.L. Hamilton, another former chaplain turned quartermaster who, like Sullins, also worked for General George Crittenden in East Tennessee. One payroll invoice in Lewis' file mentions his Kingston service. 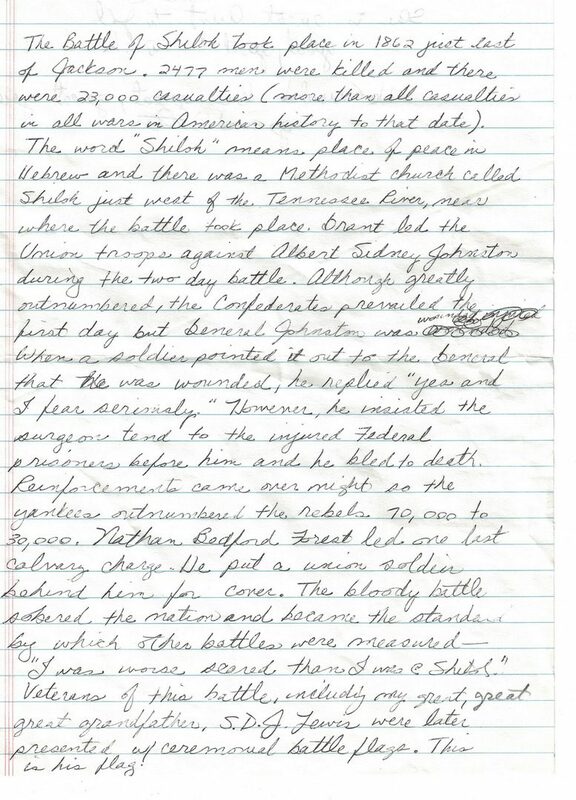 One last notation states that Lewis was working for Hamilton as late as July 22, 1864, as the battles swirled around Atlanta itself at this time. 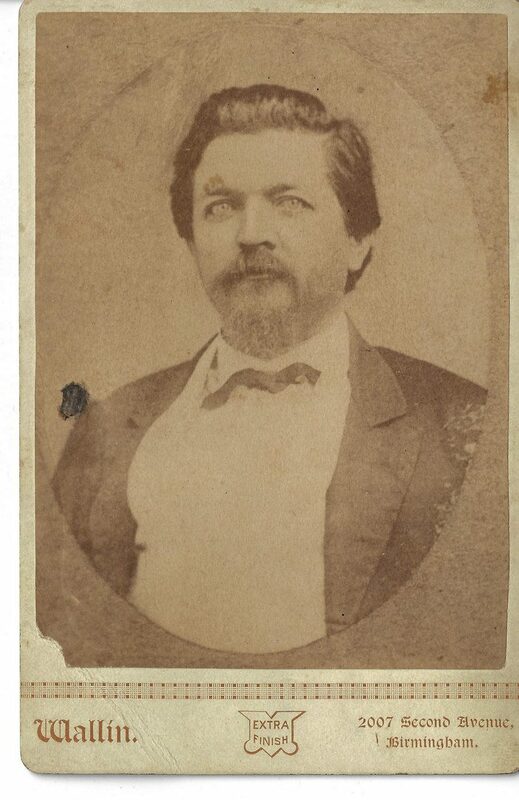 While nowhere in the Lewis' Compiled Service Record states a date, it was probably in mid-1864 when he joined the 12th Tennessee Cavalry Battalion, and may have been on detached service from them remaining in the quartermaster department or perhaps serving in the field with that command. The record is not clear at all on this.After the war, Lewis married Helen Arthur of Kentucky and lived in Knoxville, Tennessee. His daughter, Eliza, married William K. McClure in 1889. In April 1938, she wrote (as Mrs. W.K. 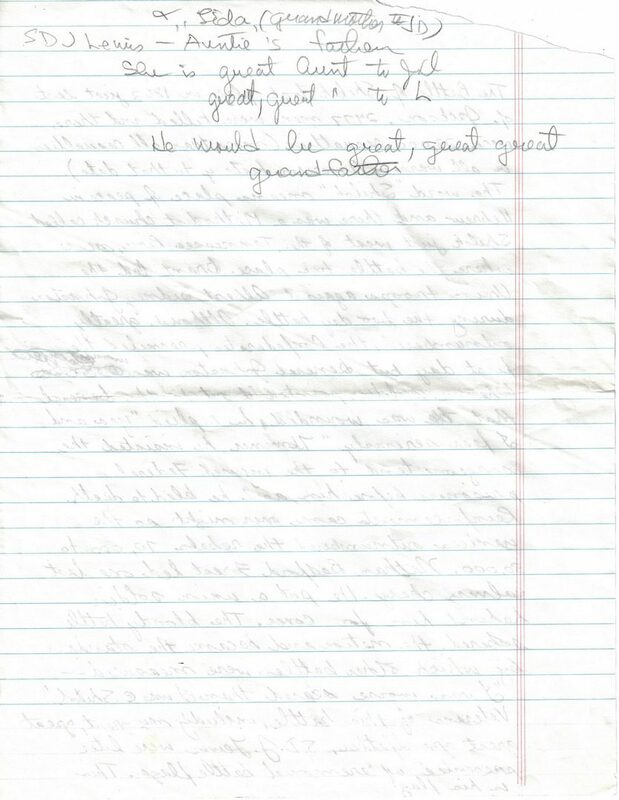 McClure) to the U.S. War Department asking for information about her father's war record and she received a response that features both typed and hand written paragraphs. This letter is also in Lewis' file.12th Tennessee Cavalry Battalion. A detailed history of this unit is not needed but since Lewis' file is with them, some history might be helpful. This battalion was formed on September 1, 1862 from several companies of partisan rangers that had been raised in East Tennessee pursuant to the Partisan Rangers Act of April 1862. These companies had been raised in Hawkins County and Greene County as well as the towns of Greenville, Morristown and Knoxville. Major T.W. Adrian was in command until his death in November 1862 whereupon Major Frank Phipps and soon after Major George Day (later Lt. Colonel).Their first action was in the Kentucky Campaign of August-October, 1862 where they fought in the cavalry brigade of Joseph Wheeler. After the campaign's conclusion, they were transferred to the brigade of Colonel John Scott, Department of East Tennessee. In mid-June 1863, the 12th Tennessee Cavalry Battalion was consolidated with the 16th Tennessee Cavalry Battalion to become Rucker's Legion, led by Col. Edmund Rucker. The new command fought in the Chickamauga Campaign of September as part of Wheeler's cavalry corps before being sent back to East Tennessee where they would fight during the miserable winter of 1863/1864.With Rucker's transfer to Mississippi, his legion was disbanded in February 1864 and both battalions reverted to their old formations. Now part of the Department of East Tennessee and Western Virginia, the 12th Tennessee Cavalry Battalion became part of General John C. Vaughn's Brigade with whom they would serve for the rest of the war fighting in the Valley of Virginia to upper East Tennessee. When the news of Robert E. Lee's surrender at Appomattox on April 9, 1865 arrived, the battalion and the rest of the Confederate troops in this department disbanded and went home. If Lewis joined this battalion after July 1864 he would have been involved with their war history as part of Vaughn's Brigade for the rest of the war. Confederate Bible or Personal Flags: To date there has not been any written essay covering the topic of Confederate Bible or personal flags. This is a shame as there are a number of them still extant and their existence can add to our knowledge of how flags can have a personal connection to home in addition to the unit battle flags presented in the early phases of the Civil War to companies and regiments as they formed.These flags were typically made by ladies from the home towns or counties from where men derived to form combat units. Some went off to war with soldiers in 1861 while others would be made during the war and sent to them by mail. Their sizes varied from three by four inches to one by two feet. 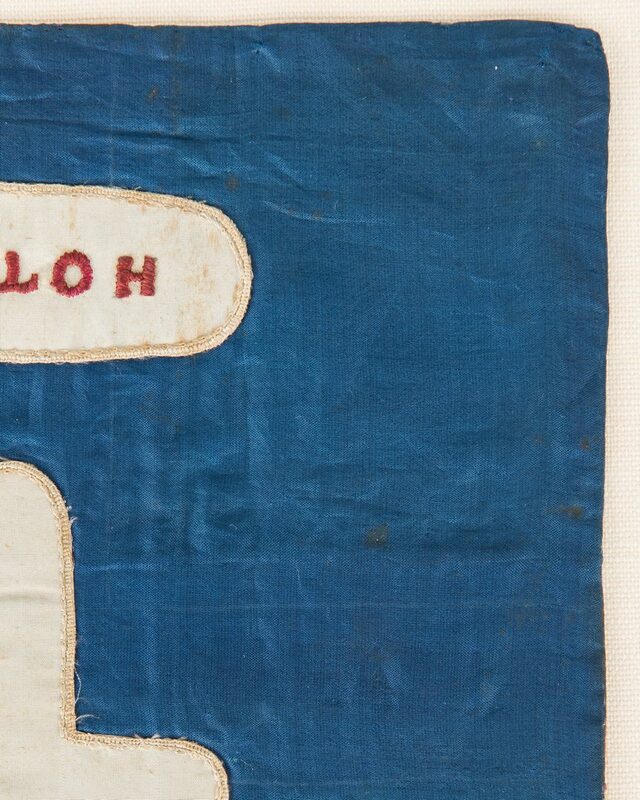 Some of the larger ones were flown on tents and indeed a famous image of the Clinch Rifles, 5th Georgia Infantry, shows just such a flag being flown from the top of a tent with some troops depicted in front. 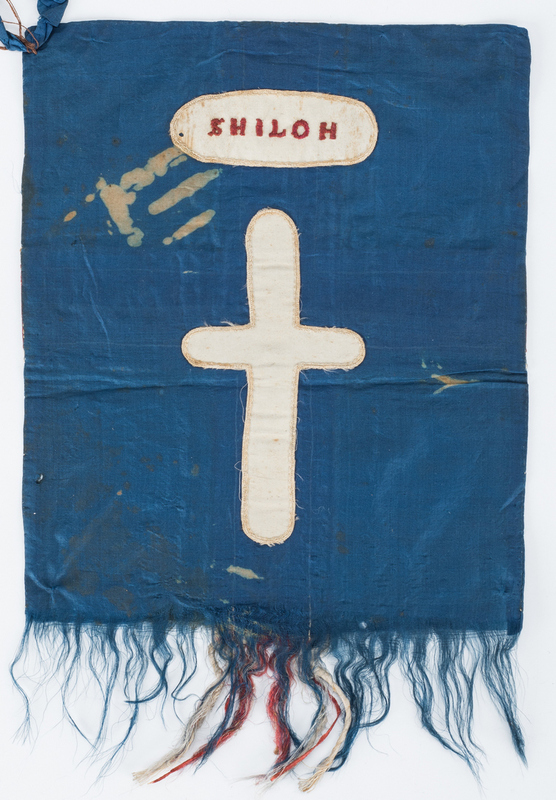 The epithet "Bible flag" comes from their probable use, at least for the much smaller flags of this type, as patriotic book marks used by soldiers as they read their Bibles. Although smaller than the aforementioned personal flags, even these varied in both sizes and quality of manufacture. The vast majority of these flags I have seen are of the First National pattern. There are some of the Second National pattern and even Third National but the First National pattern dominates. The star counts also vary although no flag historian has ever created a data base of these to track that. Some stars are ornate while I have seen others that are two simple crossed stitches including one in the collections of the Tennessee State Library and Archives bearing fifteen such stars. This flag was made in Nashville. Very unique to these flags are those of a battle flag pattern as used by the Army of the Mississippi/Army of Tennessee.Battle Flags of the Army of the Mississippi/Army of Tennessee. The four components of the army that formed in Corinth, Mississippi in March 1862 brought, in two cases, unique battle flags that had been adopted earlier in 1862. Polk's Grand Division, later Polk's Corps, developed a flag based on Episcopal Church heritage and heraldry. Polk, a West Point graduate who was also an ordained Episcopal minister, was Bishop of the Southwest before the war. This flag utilized a red Cross of St. George (+) bearing thirteen white stars on a blue field. The first version lacked the white fimbration that ran between the cross and field. Forty five of these were made of bulk purchased dress silk in Memphis, Tennessee in January 1862 and sent to Polk's troops who were in upper West Tennessee as well as the area around Columbus, Kentucky. 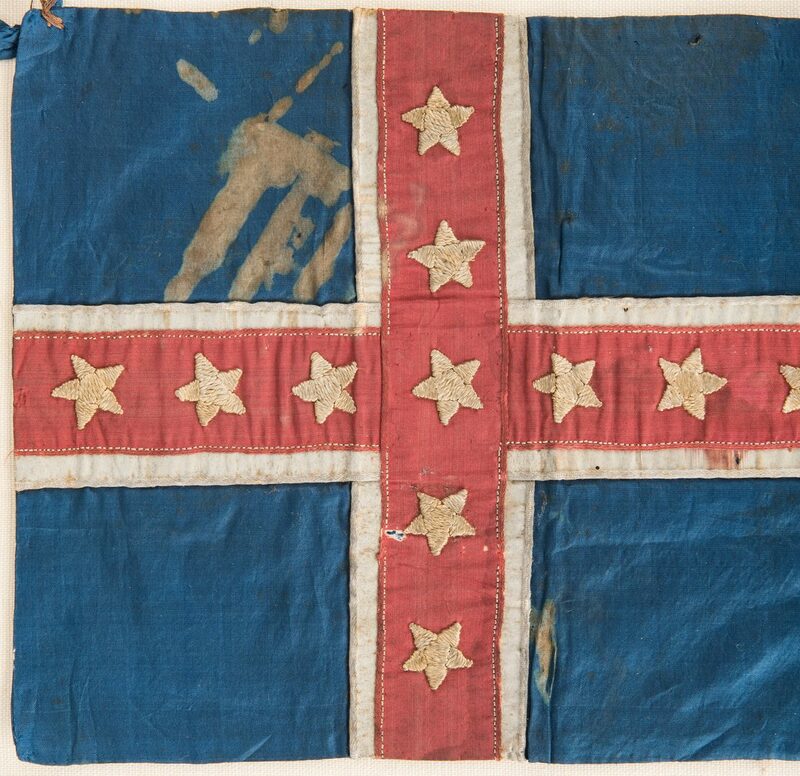 Of these only three survive today.In August 1862 a second version of this flag was made for Polk's corps, especially General Benjamin F. Cheatham's Division just prior to the start of the Kentucky Campaign. These flags, made of wool with cotton stars, were smaller, bore only eleven white stars and added white fimbration to the red cross. 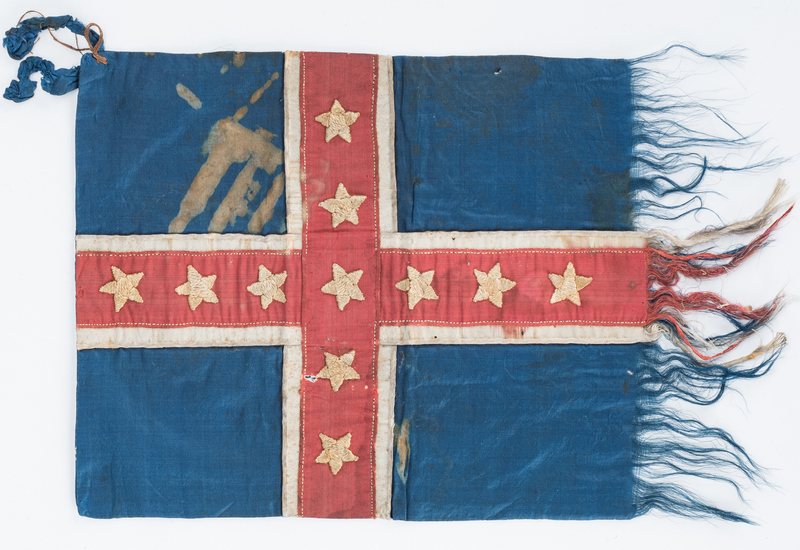 These battle flags remained in use into 1863. It is not known how many were made of this version and only a few survive today. 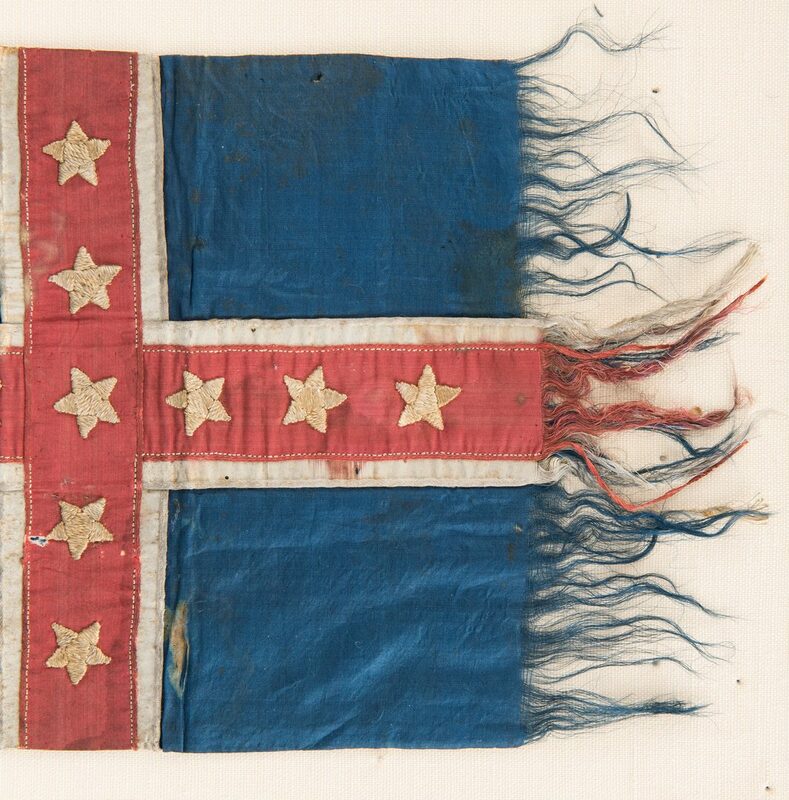 The Army of Central Kentucky, stationed at Bowling Green, Kentucky received their distinctive battle flags also in January 1862. Made by a local sewing circle from a design by General Simon B. Buckner, these simple flags were also blue bearing a white circle. This circle bore the unit designation of each regiment. There was a white hoist edge. 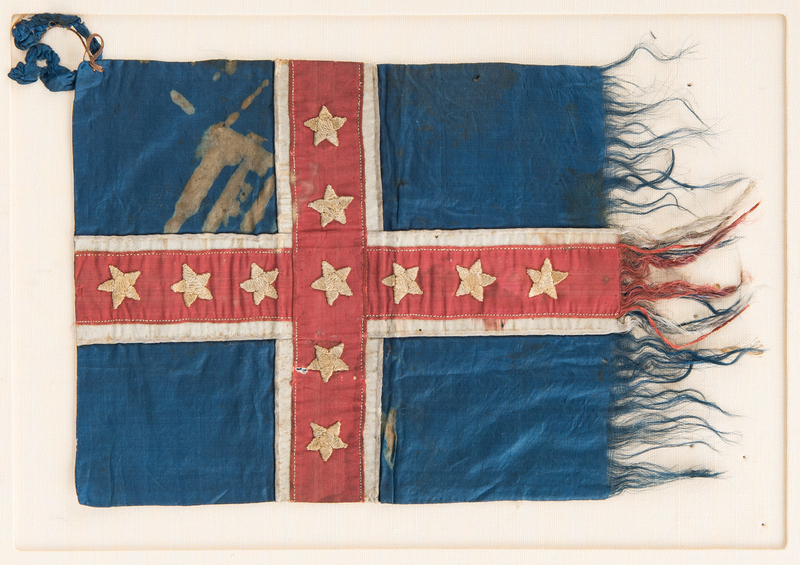 Buckner's Division brought these flags to Fort Donelson when they were transferred there in February 1862. With the rest of the army becoming known as Hardee's Corps, the name of this battle flag has come to be known as the Hardee pattern. Hardee's Corps would use these through 1863 when they were replaced by the rectangular Augusta Depot Southern Cross pattern. From 1864 until the end of the war, however, Patrick Cleburne's Division not only continued to use this pattern, but received two newer versions as the year progressed. Bragg's Corps, which came up from Mobile and Pensacola to Corinth, carried mostly First National flags and upon arrival, General Bragg was informed that his corps would henceforth carry a flag based on the Southern Cross pattern that Beauregard had been instrumental in getting adopted by the army in Virginia when he was there in the fall of 1861. This flag had diagonally crossed blue bars (X) with white fimbration bearing twelve white stars (with six pointed stars) on a red field. Three sides of the flag were bordered in yellow. The flags were roughly square. 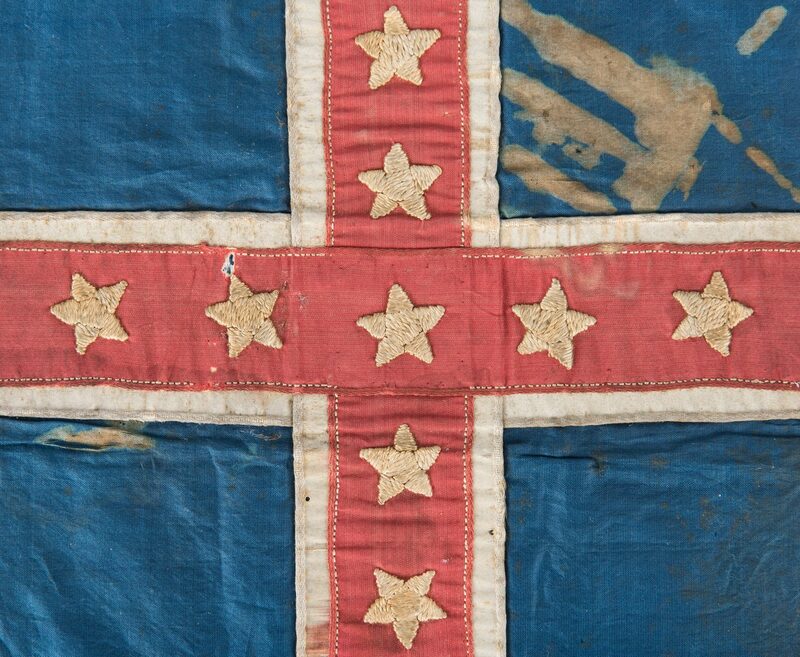 Made in New Orleans and shipped to Corinth, they became known as the Bragg Pattern battle flag. Polk's Corps had a set made as well but they did not arrive in time for use at Shiloh and equipped the corps after that battle although mostly replaced in August by the second version of the Polk Corps flag. Breckinridge's Reserve Corps (later his division) used mostly First National flags although in May 1862 would also create their own distinctive flags. 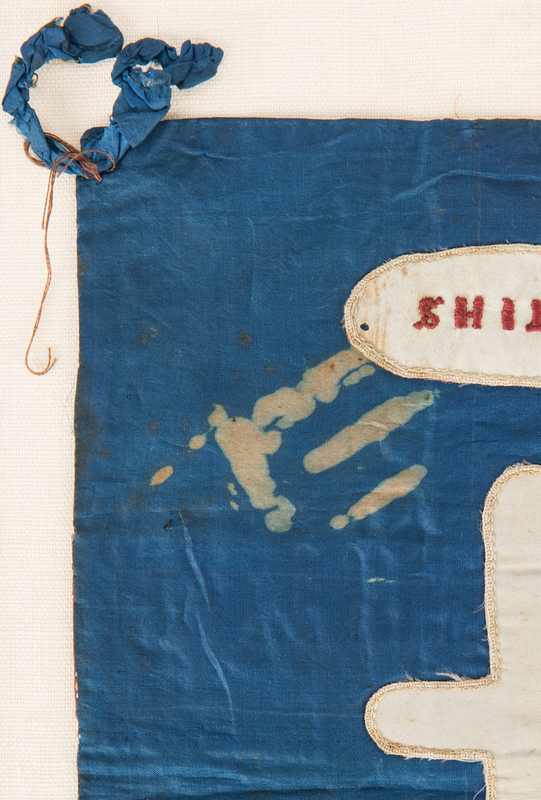 As the Army of the Mississippi marched from Corinth to fight at Shiloh in early April 1862, staff officers rode the along the marching columns of troops carrying examples of the three main corps flags announcing to them the name of the corps they represented intending to familiarize the men with them to avoid friendly fire incidents. Several years ago at the Franklin, Tennessee Civil War show, one dealer had a Bible/personal flag for an Arkansas soldier of the Hardee pattern. I have never seen one prior to this nor after so far. Polk Corps Bible/Personal flag of S. Duff J. Lewis. The exciting thing about this flag is that it is the first of the Polk Corps pattern that I have ever seen in over twenty eight years of flag research. In my opinion, this adds a great deal to its collectability. Even more unique is the Latin/Christian cross on the reverse side also bears a battle honor for "Shiloh". No Bible/personal flag that I have seen or have files for bear any battle honors although a couple bear the name of the maker or something patriotic. This, too, greatly adds to its collectability. 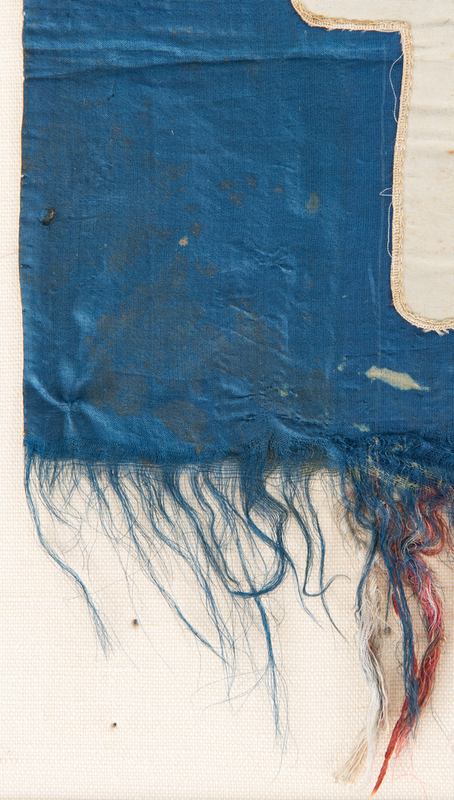 The flag is made of machine sewn silk. The red cross bears eleven embroidered white stars. 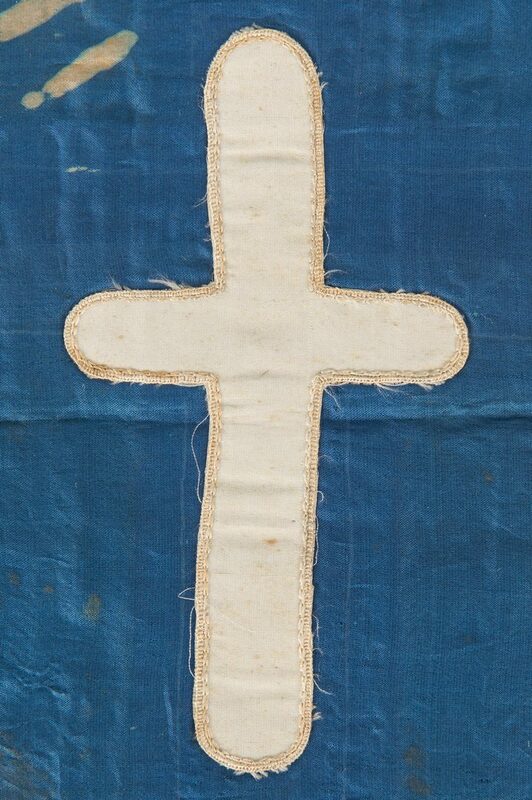 On the reverse side a white silk cross is sewn to the blue field while the battle honor is also embroidered in a white silk oval. The fly end is feathered rather than solid. Overall, the flag measures 11 1/2 inches on the fly by 7 1/2 inches on the hoist. A small semi-looped attachment is sewn to the upper left corner of the flag resembling ties that would attach a battle flag to its staff. In this case it is only decorative. There is some sort of stain in one quadrant of the flag. A smaller stain looking like it came from the same source is also on another portion of the field. 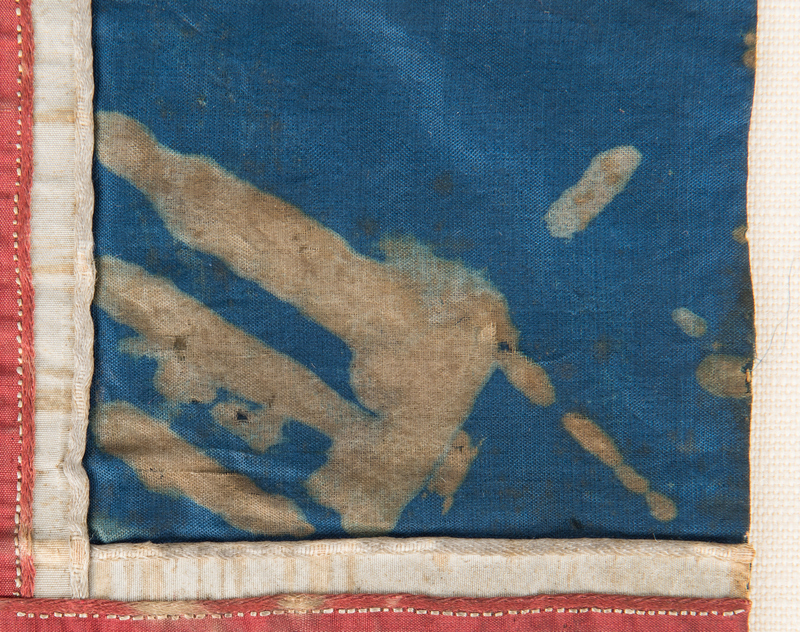 This would need to be seen by a conservator with experience in 19th Century flags to determine what the stain is made from. According to a letter written by an unknown family member after the war, the flag was given to, "veterans of this battle, including my great, great, great grandfather, S.D.J. Lewis, were later presented w/ceremonial battle flags. This is his flag". As has been reported already, Lewis was in Corinth during the Shiloh campaign working for the brigade quartermaster, David Sullins. Quartermasters would go with their brigades as they marched into action making sure that needed supplies were sufficient and that more could be brought forward to the battlefield as it waged. However, as mentioned, at the time of Shiloh, Mullins was quartermaster of the Third Brigade, which was Colonel Statham's of Breckinridge's Reserve Corps. This corps did not use Polk Corps battle flags at Shiloh. So how did such a flag get presented to Lewis? 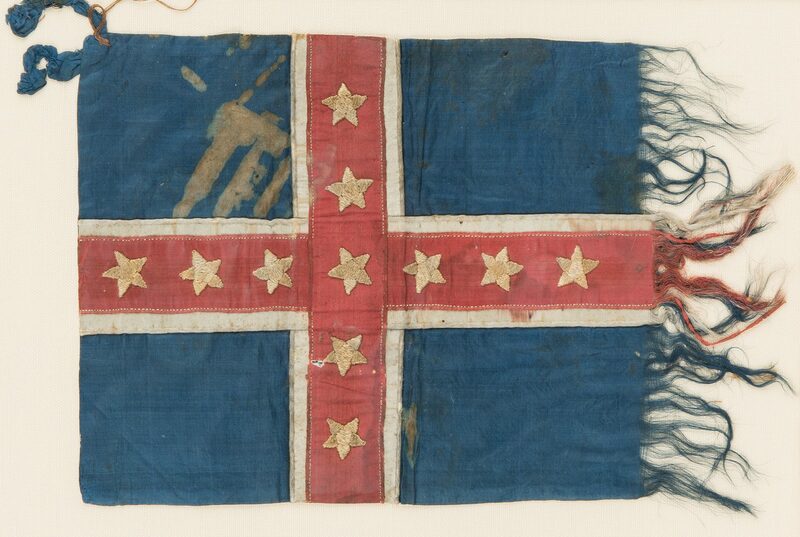 One can only speculate as to how this happened and there is no evidence that has been located to date that can tell us how a flag of one corps made it to a soldier of another corps. Nor do we know how many of these were made or even when they were made or presented. I can theorize that these came in the summer of 1862 at the earliest as it follows the second version of the Polk Corps flag that came out in August 1862. This report will include images of both versions of these flags so that the mentioned differences can be noted. Conclusion: While some questions remain regarding this flag, there is no doubt as to its authenticity due to its line of ownership coming from Lewis' family as proven by the letter of his great-great-great grandson. As stated before, this flag is very unique and will be quite interesting to flag collectors due to it being the only known example of a Bible/personal flag of this pattern. 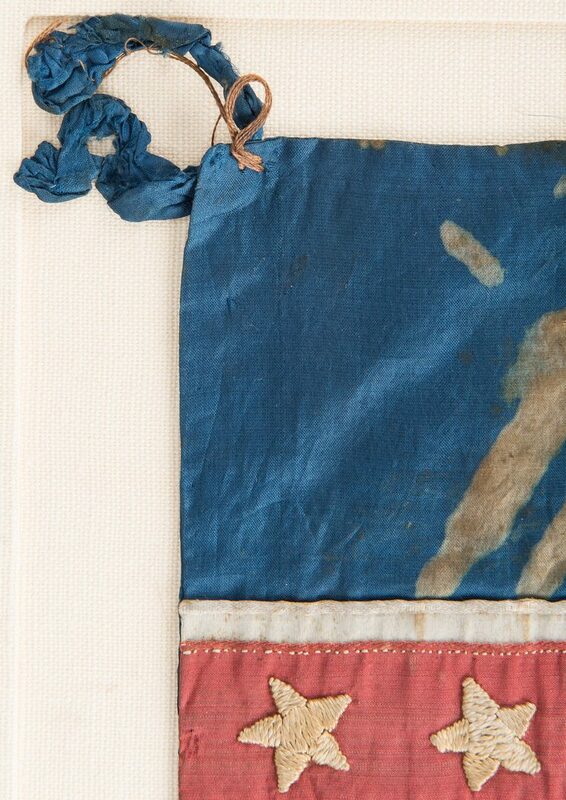 It is exceedingly well made and quite striking with vivid colors, obviously the product of a maker with considerable skill used to embroidery and working with silk.Besides images of the Polk Corps flags, this report will also include the Compiled Service Record of S.D.J. Lewis. Other documents, already in the possession of Case Antiques, will also accompany the flag upon sale. Gregory G. Biggs, Military Historian, December 21, 2018. Bibliography: Connelly, Thomas Lawrence, Army of the Heartland: The Army of Tennessee, 1861-1862 (Louisiana State University Press, Baton Rouge, 1967); Hafendorfer, Kenneth A., Mill Springs: Campaign and Battle of Mill Springs, Kentucky (KH Press, Louisville, 2001; )Horn, Stanley F. and others, Tennesseans in the Civil War, Volume One (Civil War Centennial Commission, Nashville, 1964); Madaus, Howard Michael and Needham, Robert D., The Battle Flags of the Confederate Army of Tennessee (Milwaukee Public Museum, Milwaukee, 1976); Roman, Alfred, The Military Operations of General Beauregard, Volume 1 (Da Capo Press, New York, 1994); Smith, Timothy B., Shiloh: Conquer or Perish (University Press of Kansas, Lawrence, 2014); Sword, Wiley, Shiloh: Bloody April (Revised Edition) (Morningside Press, Dayton, 2001); The War of the Rebellion, A Compilation of the Official Records of the Union and Confederate Armies, Series I, Volume X, Part Two (Government Printing Office, Washington, 1884). Other Sources: Greg Biggs Flag Files, Clarksville, TN; Compiled Service Records of Confederate Soldiers who Served in Organizations From the State of Tennessee, 12th Tennessee Cavalry Battalion, Duff Lewis File (National Archives and Records Administration, RG 109, Microcopy M268, Roll 53); Compiled Service Records of Confederate Generals and Staff Officers and Nonregimental Enlisted Men, Samuel T. Bicknell File (NARA, RG 109, Microcopy M 331, Roll 23); Compiled Service Records of Confederate Generals and Staff Officers and Nonregimental Enlisted Men, A.L. Hamilton File (NARA, RG 109, Microcopy M 331, Roll 115); Compiled Service Records of Confederate Generals and Staff Officers and Nonregimental Enlisted Men, David Sullins File (NARA, RG 109, Microcopy M 331, Roll 239). (Additional high-resolution photos are available at www.caseantiques.com.) CONDITION: Fraying to right edge. Surface stains, largest 2 1/2" x 1 3/8". Scattered tears, largest 3/4", with few minute holes. Loop is torn in half.